This is 40 S&W Federal American Eagle IRT 180gr. Total Metal Jacket Ammo. 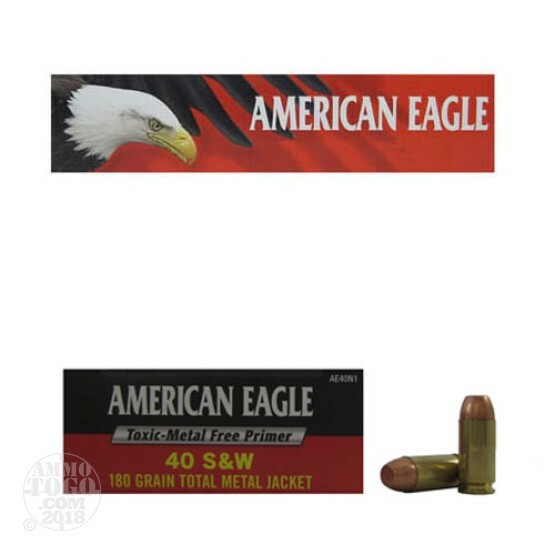 American Eagle ammunition has a reduced-lead total metal jacket bullet that is fully encapsulated in copper and it also has a Toxic-Metal Free Primer. The jacket and primer eliminates any airborne lead hazard and makes these the perfect indoor training round. This ammo is brass cased, boxer primed, non-magnetic and non-corrosive. It comes packed in 50rd. boxes. Muzzle Velocity: 1000 fps.